New Beers, TX Craft Brewers Festival Weekend & Do You Want to go to New Braunfels With Us? We’re kicking around the idea of renting a tour bus and taking a crew of people down to New Braunfels in the middle of November for Wurstfest & visiting a couple New Braunfels breweries. If you have 2 minutes, do you mind filling out this brief survey for us so we can get some feedback before making the plunge on booking a tour bus?? Thanks much! We’ll be out at the Texas Craft Brewers Festival this Saturday; swing on by & see us. Help support our state & the wonderful beer being made here by attending. Cheers! In case you missed it last week, we DOUBLED our parking capacity this past week! See here for a map! If you like the service and products you receive from us, we’d certainly appreciate your feedback on a review forum like Yelp, Beer Advocate and/or Rate Beer! We love our customers and we hope you love us back. If you’d like to send any direct feedback, email holler[at]whichcraftbeerstore.com. 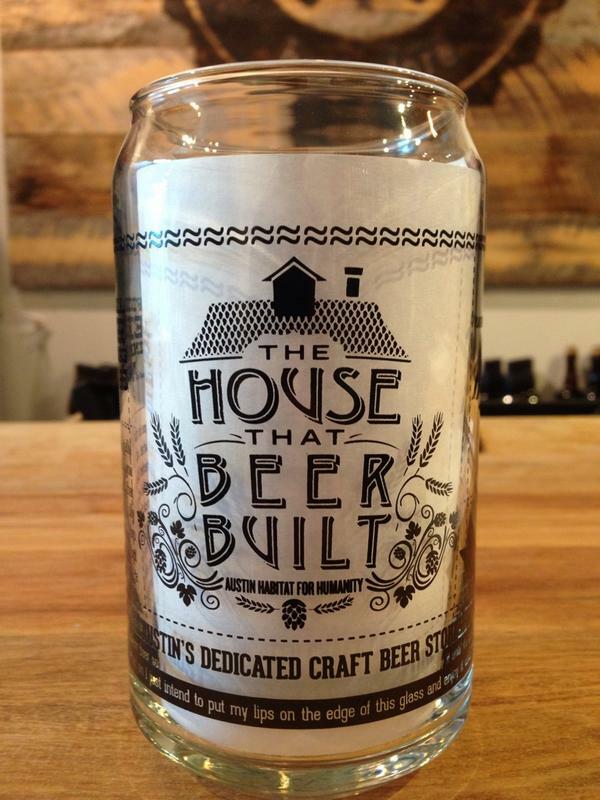 Did you know we’re currently part of the Austin Habitat for Humanity House That Beer Built? We just got more of these sweet glasses in stock today you can buy for $6 each and ALL of the profit goes to help build the home for the Huerta family. Support a great cause and get a cool glass! We’re welcoming into the store Brian Smith, the rep for Crispin, to taste some ciders from 6-8pm. We’ll be pouring free samples of The Saint, The Bohemian, Honey Crisp and a couple others. Cider is a great autumn weather beverage! Additional parking at your favorite bottle shop! That’s right, we DOUBLED our parking capacity this past week by adding the lot just across Oxford street from the store. Our customers can park there absolutely free at any time, so feel free to take advantage of that added benefit.